Soaring heat and humidity couldn’t dampen the smiles of hundreds of special-needs children and their family members on Saturday, June 30 when they rode the amusement rides and took in the carnival fun at St. Michael the Archangel Parish in Levittown. 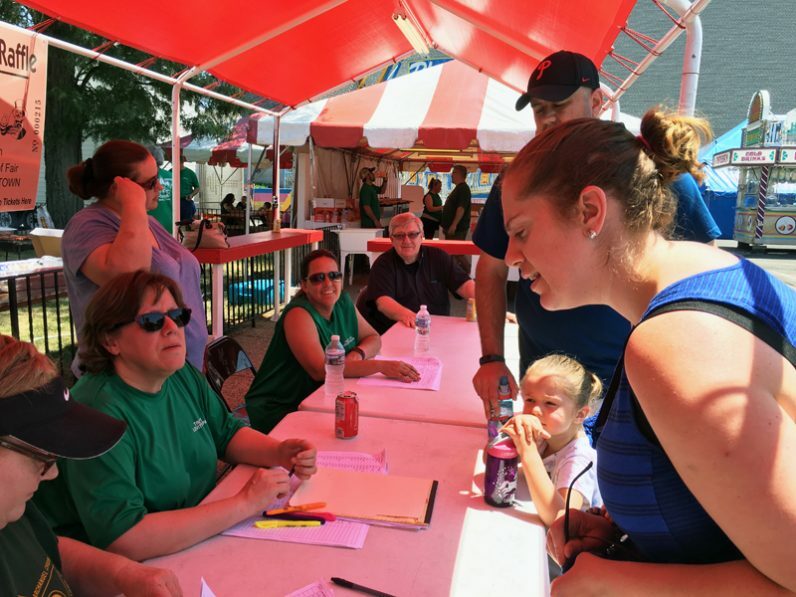 This was the 40th annual Special Needs Day, held as part of the two-week long St. Michael’s Parish Fair, a summertime institution in Lower Bucks County since 1954. This year’s fair started June 26 and runs through Sunday, July 8, with an estimated 2,500 people coming out each night for the rides, foods and other attractions at the parish on Levittown Parkway. But on Saturday afternoon, the fairgrounds were reserved for kids with disabilities or health concerns and their families. In the first few years, only about 60 to 80 people showed up for the free two-hour event, but more than 375 signed up to attend the Special Needs Day last Saturday. And more walk-ins were expected. “No one’s ever turned away,” Father DiIorio said. Kids weren’t the only ones enjoying the amusements. Older handicapped persons who came when they were children also toured the fairgrounds. Some are in wheelchairs; others walk slowly with caregivers helping them onto the rides. Steve Salemno (left) and Bill Umek, adult leaders with Boy Scout Troop 121, based at St. Michael the Archangel Parish, prepare hot dogs for distribution at the Special Needs Day Saturday, June 30 during the two-week parish fair that runs through Sunday, July 8, at the parish in Levittown. “The people who came here every year appreciate it so much,” said Sheila Rosofsky of Levittown, a parishioner and fair volunteer. As they signed in at the registration table, Doug and Teresa Traub of Yardley said they wanted to bring their two children – Natalie, 4 and Brayden, 2 – because Teresa had grown up in St. Michael’s parish and had fond memories of going to the fair as a child. But Brayden has cochlear implants above his ears to treat hearing loss. Attending the regular fair, with the noises and crowds, could be overwhelming for children like him, his mom said. But the special needs fair was just right. 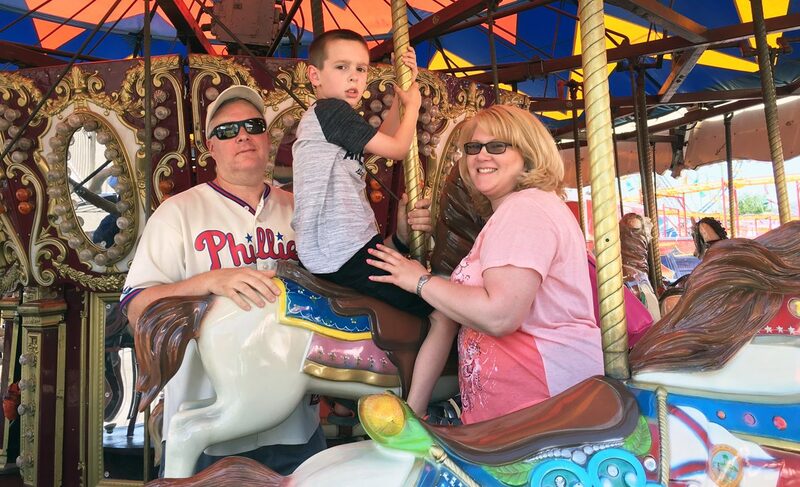 After carefully putting their son Jack, 8, who is autistic, on a hobby horse, Ann Lipcsey and her husband Thomas of Levittown prepared to ride the merry-go-round with him. “I think it’s one of the nicest things they can do for the special needs kids. We look forward to it every year,” Ann Lipcsey said. Father DiIorio explained that families with special-needs children sometimes cannot attend fairs or carnivals because the children may become upset with the noise or crowds, or it may be dangerous for them on some rides. Therefore the entire family has a hard time finding entertainment venues that they can visit together. And the children with disabilities can try out amusement rides in an environment where they won’t be as embarrassed if they become stressed because the other families are familiar with the health issues they face. This year, the Meyers of Levittown came with an extended family group, and that’s fine with the parish volunteers. “We try to get the whole family to come. That way the (special need) child is comfortable,” said James Phillips, who has chaired the St. Mike’s fair for the past 15 years. Anthony Lepre, 10, of Levittown has Angelman syndrome (a condition of developmental delay) and needed a wheelchair to help him get around Saturday. While his mom, Kelly, fed him popcorn and offered him a drink, Phil Lepre thought the event was great for his son and the other children with health issues. “It’s nice for the kids,” he said. Reithoffer Shows of Gibsonton, Fla., and the firm’s employees who run the amusement rides at St. Michael’s fair, donated the use of the rides and manpower running them as a service for the special-needs event. Boy Scout Troop 121, based at St. Michael’s, also has Scouts and troop leaders helping out. 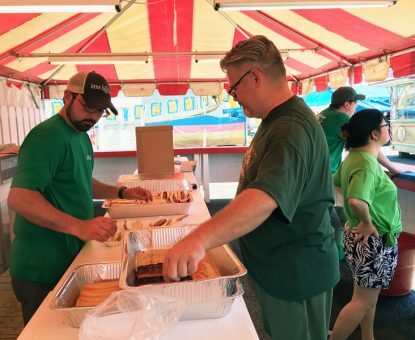 As they grilled hotdogs Saturday, adult troop leaders Steve Salemno and Bill Umek said the troop’s youths enjoy volunteering for the special needs event. “They love doing it. That’s why we do it every year,” Salemno said. Special Needs Day is a meaningful initiative.